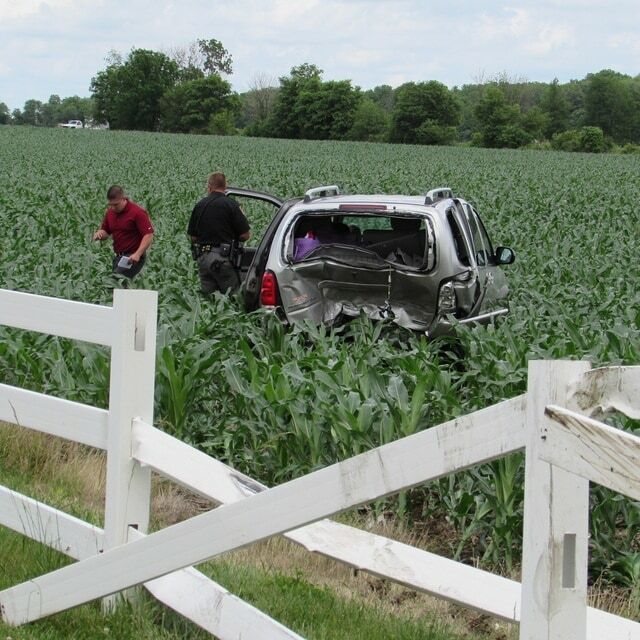 Darke County Sheriff’s Deputies are investigating a two-car accident which occurred Tuesday afternoon on U.S. Route 127 south of Greenville. DARKE COUNTY — A two-car accident stopped traffic on both lanes of U.S. Route 127 Tuesday afternoon. Darke County Sheriff’s Deputies, Arcanum Rescue and Greenville Township Rescue responded to the scene. The accident occurred near Schultz Motors south of Greenville. Initial statements by the Sheriff’s Office indicated a silver 2006 Pontiac Montana driven by Alberta J. Plessinger, 70, of Greenville, pulled out of Schultz Motors’ parking lot, heading north. The rear end of the vehicle was then struck by a black 2006 Ford Freestyle, driven by MacKenzie Raynes, 19, of Arcanum. Upon impact, Plessinger’s vehicle went off the right side of the road, crashed through a fence and ended up in a cornfield. Greenville Township Rescue transported Plessinger to Wayne HealthCare for possible injuries. Arcanum Rescue transported Raynes to Miami Valley Hospital for possible injuries. The incident is currently being investigated by the Darke County Sheriff’s Office.